Over 40 years of selfless dedication to our country . . . beginning with steadfast support of Vietnam War prisoners and injured warriors; personal sacrifice during two Presidential campaigns to force attention to problems facing America; and, continued personal and financial support of wounded and damaged Gulf War, Enduring Freedom and Iraqi Freedom veterans . . . Ross Perot can be truly called a Great American Patriot. 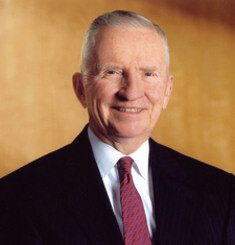 Ross Perot never took the easy way out . . . always caring enough to put his personal fortune and reputation on the line time after time . . . all for his strong love and pride of America. Starting with his first business, EDS, in 1965 and his current namesake Perot Systems Corporation, Perot has created thousands of jobs. His personal investment group seeks to invest in innovative business ventures with benefits to our quality of life. His many charitable efforts produce lasting effects on individuals lives, such as . . . early childhood intervention projects and support for educational reform. His willingness to tackle individual problems without regard for popularity, prestige, or recognition of any kind . . . and his steadfast devotion to what is good for this country and its military warriors is a testament to his worth to the USA. This great man uses his personal energy, financial resources, good name and intellectual skill for the good of all Americans . . . every day he lives. "In 2005, I volunteered at Operation Homecoming USA in Branson, Missouri. This was the first national welcome home event for Vietnam veterans. A year or so earlier (do not know exactly when), a couple of Vietnam vets came up with the idea, and approached Ross Perot for help. He, being the good guy he is, got plenty of people and companies involved, and was primarily responsible for this wonderful, week-long, long overdue tribute to our Vietnam veterans. I had the chance to go to the VIP section of the awards ceremony held that night, at which three great patriots were honored. I was able to shake Perot's hand and thank him for what he had done, mentioning that I had come from Texarkana to help out. I forgot that Perot was originally from Texarkana. We talked about the town, and also his company EDS (for which my dad worked for a long time) . . . We talked as if we were longtime friends. I just know Perot is one of the most deserving Great American Patriots around!"